Building an airport is a feat of enormous infrastructural complexity at the best of times. Expanding an already busy regional hub without negatively affecting flight operations is harder yet. Now make it even more challenging by doubling capacity while creating an iconic terminal designed to showcase the beauty of aircraft and its stunning Andean setting—in the most active seismic region of the world. Put all that together and you get “Nuevo Pudahuel,” the new international terminal at the Santiago, Chile, airport. As an aviation photographer and an unapologetic #Avgeek, with a design background and an interest in architecture, training my lens on this feat of logistical prowess ticked a lot of boxes. And as someone living in seismically benign Central Canada, I was fascinated by how you’d go about designing an airport in the middle of the “Ring of Fire” seismic zone where Santiago sits. Last year, it had 10 quakes with a magnitude of 3.5 or more. And in 2010, an 8.8 on the Richter scale quake that lasted a terrifying three minutes caused relatively little damage to the current terminal, built in 1994. It reopened shortly after suffering cosmetic damage. 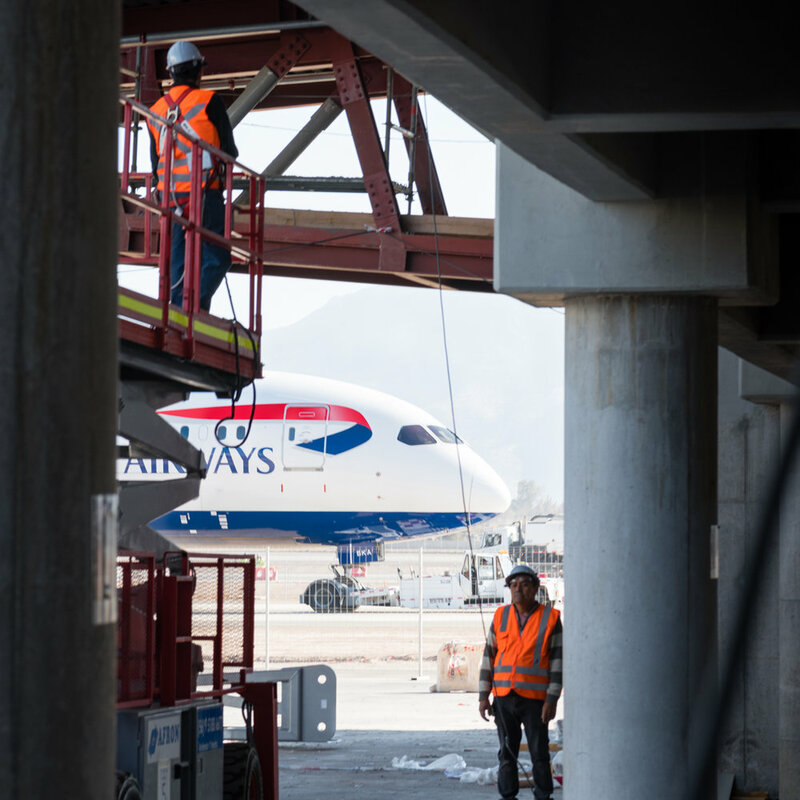 On site at SCL, I asked Rodolphe Gerar, Design and Works Supervision Manager, how the airport withstood all that shaking. What saved the terminal (and much of Santiago, for that matter) from total collapse, he explained, were the city’s strict building codes and long experience in building resilient structures. “With every record-setting quake, building codes are amended to state that all future construction must withstand a quake one full magnitude point higher. So after 2010’s record quake, all new buildings must be built to withstand a quake of 9.8, even though a quake that size has never occurred,” he said. 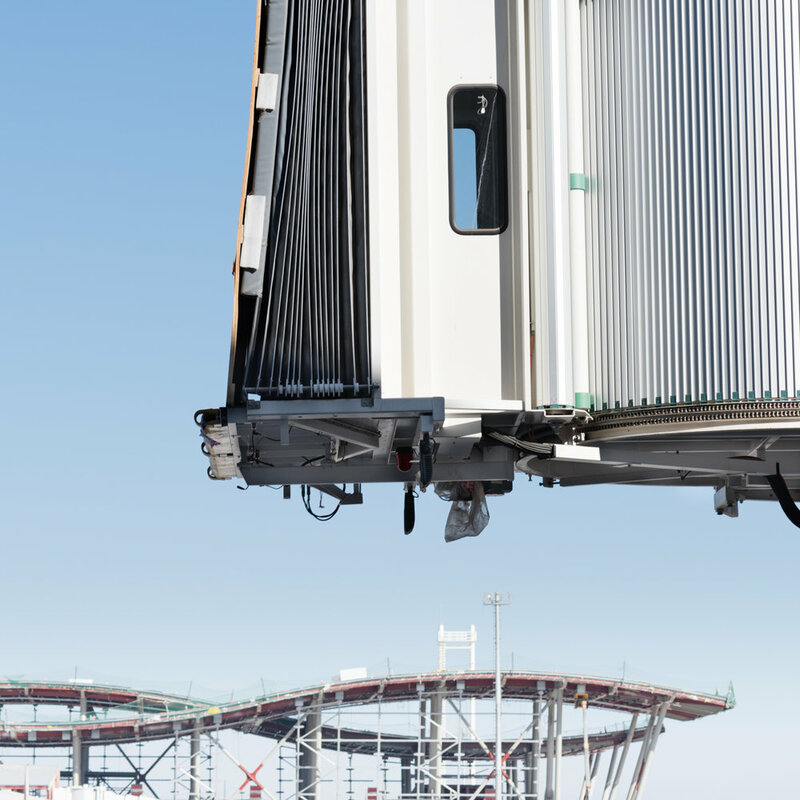 In order to achieve that degree of resilience, the new 200,000 square meter (2.1 million square foot) terminal will be “compartmentalized” into 38 separate “plates,” which are literally separate buildings independent of each other, and connected with 15 cm (6 in) expansion joints. In the event of an earthquake, those very large joints will allow each “plate” to move independently and avoid chain-reaction structural failures. It’s only when I don my hardhat and steel-toed boots to set off for the photoshoot that the magnitude of the project truly dawns on me. As massive as it is, Pier C, scheduled to open in December 2019, is just one of four new piers in the terminal. 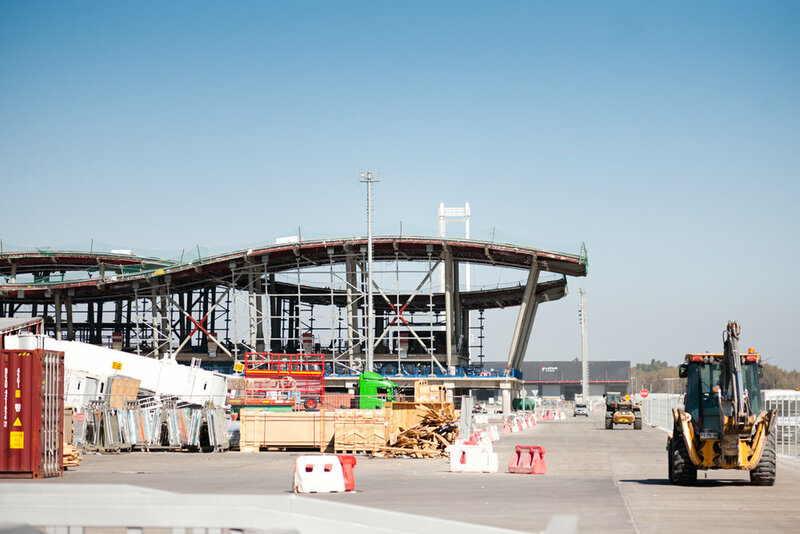 When fully complete in 2020, Nuevo Pudahuel will include 45 new gates and double SCL’s capacity from 15 million to 30 million passengers a year. The airport is a major hub for LATAM, the biggest carrier in South America. The massive edifice’s scale is matched only by the bold architectural statement it’s making. The undulating roofline has been designed to both mimic the Andes visible in the near distance and shelter generous and amenity-laden public spaces. Those spaces are located largely post-security — the consortium that manages SCL, including France’s ADP and Vinci and Italy’s Astaldi, decided to focus the lion’s share of amenities where dwell times are longest. Apart from the Andean-inspired roofline, the colors and textures of four of Chile’s main climatic regions (Easter Island, Los Lagos, Atacama Desert, and Patagonia) will “brand” each of the four piers and help passengers navigate the terminal. 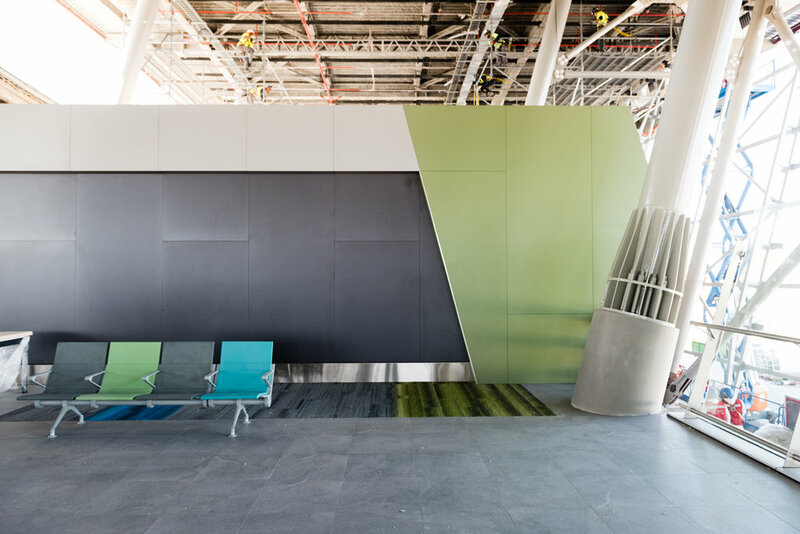 In a further illustration of the focus on user experience, the airport has installed a full-sized mock-up of the fittings, furniture, and interior finishes in an active construction zone on Pier C, allowing it to adjust, refine and even re-design the spaces in real-time. Workers installing windows and insulation and even painting beams around a “finished” departure hall is a surreal sight, to say the least — but a great demonstration that a focus on engineering doesn’t mean less emphasis on aesthetics, sense of place and user experience. But back to those seemingly impossibly large expanses of glass framing majestic Andean (and tarmac!) views. How can “world’s most active seismic zone” and “undulating glass” ever be compatible? Gerar makes the impossible sound simple: “Glass is a material that keeps its shape. To ensure that the thermopanels do not break in case of a tremor, we had to study an inclined curtain wall able to move as a whole unit in all three axes. This was certainly a challenge to design and implement”. The curtain wall is also inclined away from the public spaces, providing an extra layer of safety. 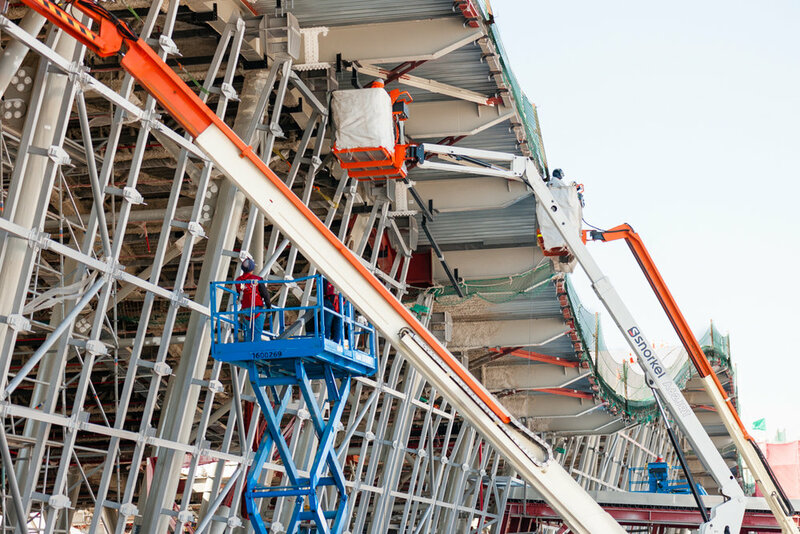 Watching an airport come together is almost like taking in a performance of Cirque Du Soleil, with choreographed and harnessed workers wherever you look. Walking back to the older terminal, I’m struck by the fact that what makes this building so incredible is the engineering behind it and the thousands of details that no one can actually see: the joints and structures that will keep it — and passengers — safe should an earthquake happen. In that respect, at least, Nuevo Pudahuel is a pure expression of form and function coming together artfully. Very Plane News is a magazine dedicated to aviation design, airport architecture, and the aesthetics of the passenger experience.